This article discusses a feature that is available to Dropbox Professional and Dropbox Business customers. 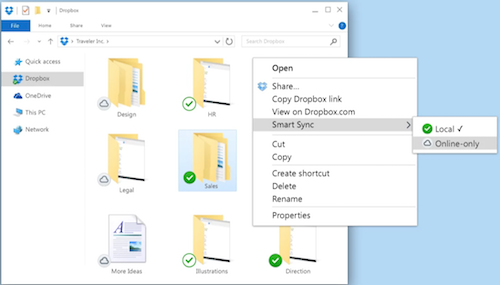 With Smart Sync, content on your computer is available as either online-only, local, or in mixed state folders. Online-only content appears in the Dropbox folder on your computer, but doesn’t use the full amount of space that the file otherwise would. You can see the file, but the content isn’t fully downloaded until you need it. Only information about the file, such as the file name, location, and date the file was updated, is downloaded. Local content is downloaded and saved on the hard drive of your computer. You can directly edit these files from applications on your computer. This content is still backed up to Dropbox as well. Mixed state folders contain both local and online-only content. Note: To use Smart Sync, you need to install the Dropbox desktop application on your computer. How do I make content online-only? Click the Dropbox icon from the menu bar. Control-click or right-click the file or folder. How do I sync online-only content to my computer? You can open a file as usual through your application or Finder. Dropbox downloads the entire file to your computer. How can I choose a default setting for new content? Click the gear icon and select Preferences... from the menu. Choose your work Dropbox account. Admin default: the default setting chosen by your team admin. Local: all new content downloads to your computer. Online-only: manually download files to your computer when you need them. You can open a file as usual through your application or Windows Explorer. Dropbox downloads the entire file to your computer. What are the system requirements for Smart Sync? How fast can Smart Sync free up space on my hard drive? Apple's operating system macOS 10.13 (High Sierra) uses a new type of file system called APFS. With APFS, the operating system takes snapshots of the file system and available hard drive space. These snapshots may not update after you've used Smart Sync to set Dropbox files as online only. This means that hard drive space you freed up with Smart Sync may not be immediately reflected or available if this snapshot hasn't updated. This hard drive space should eventually be freed up by the OS, but the amount of time this will take can vary. This isn't a behavior specific to Dropbox, but instead the designed behavior of macOS. I have folders selectively synced, how do I make my selective sync content online-only? Follow the steps to change the selective sync settings for your folders. Once your folders are no longer selectively synced, they automatically become online-only folders. Does changing a file to online-only delete the file from my Dropbox? No, making a file online-only doesn't delete it from your Dropbox. When you make a file online-only, the file content will be deleted from your computer, but the full file will still be available in your account online and on your other devices. Do online-only files use space on my local hard drive? Online-only files use a small amount of space on your hard drive to store information about the file, such as its name and size. This uses less space than the full file. Can I access online-only content when I’m not connected to the internet? No, online-only content isn’t stored locally on your computer. Connect to the internet to access online-only content. Can I move online-only files within my Dropbox folder? Yes, you can move online-only content inside the Dropbox folder on your device, and changes sync to your other devices. If you move online-only content outside of the local Dropbox folder, the content downloads to that location. What happens if I delete an online-only file or move it to my trash? Any actions taken on an online-only file sync to your Dropbox account and to anyone else who shares that file. Since the file isn’t stored on your computer, the file content will not be available in your trash. You can restore deleted files from your Dropbox account online. Learn more about restoring files. Can I use my desktop search to find online-only files or their contents? You can use your desktop search to locate online-only files and folders by name. However, online-only files don't contain the full contents of your file, so your desktop search can't search file contents. Can I have different Smart Sync settings on different devices? Yes, Smart Sync settings are unique to each device you link to your Dropbox account. Can I have local files in an online-only folder? Yes, if a folder is online-only, you can download individual files inside the folder. Can I remove content from my device completely without removing it from my Dropbox? Yes, if you don’t want files to appear on your device, you can use selective sync. Selective sync helps you choose which files appear in your desktop application, and which are only available online. Can I use Smart Sync on my personal account? 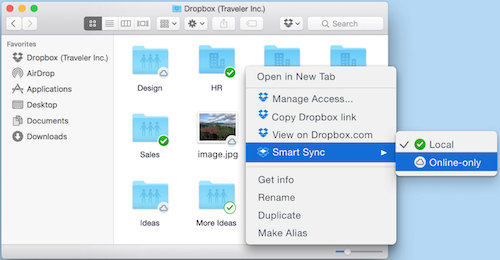 Smart Sync is available for all Dropbox Professional and Dropbox Business users. If you connected a personal account (Basic or Plus) to a Business account, Smart Sync won't be available for that personal account. Will enabling Smart Sync require a driver to be installed? Yes, Smart Sync requires enabling a driver (or system extension) in order to integrate with your operating system’s filesystem. Mac and Windows computers commonly use drivers to interact with peripherals such as mice and printers. Our driver allows the Dropbox client to sync files on your filesystem when you open them (for online-only content). We engineered this driver to only provide the integration necessary to power Smart Sync. It only interacts with files inside your Dropbox storage location.